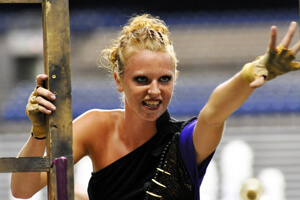 Open Class: Brass: Spartans (16.2), July 20, Manchester, NH Percussion: Genesis (15.2), July 16, Bentonville, AR Color Guard: Genesis (15.1), July 16, Bentonville, AR View all scores and recaps. Storylines to watch • Flip flop at the top: Carolina Crown had won nine straight until the Blue Devils got ahead by a tenth of a point July 18 in Denton, Texas. The Devils widened that lead on Crown two days later in San Antonio to 0.25, however, Crown once again went ahead a day later, putting up a 89.90 to the Blue Devils' 89.80 in Austin. Carolina Crown currently holds an 11-4 lead in head-to-head matchups this summer. The widest margin between the corps has been 1.35 with the slimmest 0.1. 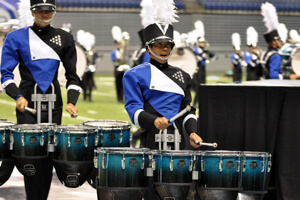 • Not down for the count: Having tied Carolina Crown for the top spot over the Blue Devils on July 14 in DeKalb, Ill., the Cadets have been at most a point behind the Blue Devils and Carolina Crown over the last week. • July 20 in San Antonio marked the first time the Crossmen finished ahead of Troopers since July 12 in La Crosse, WI. Prior to San Antonio, Troopers had won three straight. • Crossmen have also been flip-flopping finishes with the Blue Stars. Crossmen went ahead by a tenth of a point on July 18 in Denton, the first time since June 29. Blue Stars went back ahead of Crossmen two days later in San Antonio by 0.55. The two corps will face each other three more times this season before the World Championships in Indianapolis. • After the Colts scored 2.25 points ahead on July 17 in Broken Arrow, Okla., Pacific Crest was able to edge the Dubuque, Iowa corps by a half a point three days later in San Antonio. 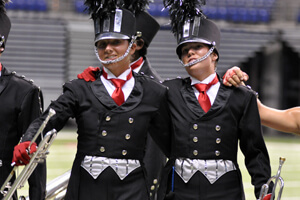 The two corps have finished close in recent years, taking 16th and 17th place at the 2012 DCI World Championship Semifinals. • For World Class corps that competed in Minneapolis on July 13 and in San Antonio on July 20, the Cavaliers marked the most improvement in total score (4.6 points between the two events), while the Academy marked the least (2.85 points). • In the last week, three more corps eclipsed 80 points in total score putting the total number of corps to do so in 2013 at 10. Blue Knights passed the mark for the first time (80.75) on July 17, the Cavaliers (81.35) on July 18, and Boston Crusaders (80.75) on July 19. Blue Knights were able to reach 80 points seven days earlier in 2013 than in 2012, and Spirit of Atlanta (79.20 on July 20) looks to be the next corps on the verge of reaching the 80-point milestone. • Based on the results of Sunday's event in Austin, Carolina Crown (89.90), Blue Devils (89.80) and Cadets (89.50) all look poised to pass 90 points in the coming week. • In Open Class competition, 7th Regiment finished ahead of the Spartans for the first time since June 30, 2012, this past Saturday in Manchester, N.H. 7th Regiment passed the Spartans there by three tenths of a point. In four previous meetings this summer, Spartans won by margins between 3.90 and 1.90 points. • Featuring a lineup of 10 Open Class corps, July 27 in Kalamazoo, Mich., will be one of the first solid indicators this summer of how the Open Class corps stack up competitively. At this event, Vanguard Cadets and Blue Devils B will rejoin the DCI Tour in their first competition since July 14 in California. International Class corps Taipei Yuehfu (Taipei City, Taiwan) will also make its first performance of the summer.